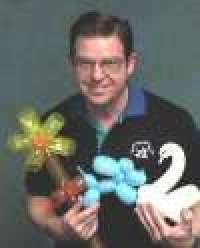 Ralph Dewey has been active in the art of balloon sculpturing since 1975. He first began using balloons as part of a bus ministry at his church. His first balloon book, Dewey's New Balloon Animals, was published in 1976. Since that time, he has authored 14 balloon books. He has also written dozens of magazine articles on balloon ministry, clowning and similar topics. They have appeared in, Clown Alley, Clowning Around, The Calliope, Clown Impact Newsletter, Laugh*Makers, The Christian Conjurer, The Cross and the Clown and Church Recreation Magazine. He was also featured in Balloon Magic, The Magazine. Ralph has appeared on The Swans Place TV show and also a Daystar network program called Hide The Word In Your Heart Club. He has lectured at most of the major balloon twister conventions. He was one of the first pioneers in the area of gospel balloons, and is well known as a leader in the art of balloon sculpturing. In addition to books on balloons, he has also written books on gospel chalk talks, gospel clown skits, gospel paper tricks, clown clip art, clown comedy and gospel juggling. To date, Dewey has published a total of 26 books and 4 videos. His talents also include cartooning, puppetry, comedy, magic and juggling. He regularly uses balloons in his child evangelism ministry. He is often seen lecturing at conventions and teaching workshops. He has been a staff instructor at two clown camps and originated the "Joey to the World" gospel clown convention. He hosts the DewJam Gospel Balloon convention every year in the Houston, TX area. Dewey gives God the full credit for his success. During the 1980's he earned five "Best Balloon Lecture" awards from the Fellowship of Christian Magicians. At the 2004 Millennium Jam he received their Life Time of Sharing the Magic of Balloons award. At the 2005 DiamondJam convention he received a plaque celebrating his "30 Years of Service to the Balloon Twisting Industry." Merely the most prolific and creative twisting author. Dewey never seems to hit a wall with his creativity. After 30 years, he's still innovating at the most basic of levels by creating new techniques and twists. He also never seems to hold back when it comes to sharing. He gives freely, and yet never runs out of material to teach the rest of us. In 2003 he started presenting Dewey's Balloon Excellence Awards to twisters who deserved recognition for their twisting abilities. He has also written a couple of books in the field of industrial instrumentation. "Walt Disney once said that you can't stop people from stealing your ideas. All you can do is create ideas faster than they can steal them. I agree with Walt."